Valves are linear to lanceolate and taper to bluntly rounded apices. The raphe is eccentric and located within a canal. The raphe lacks a central nodule. Fibulae are thick at the valve margin and typically extend across value to the opposing margin, although this feature is not visible in all specimens. Fibulae are irregularly spaced along the valve margin with 1-4 striae separating them. Striae are distinctly punctate. This taxon conforms to the concept of N. semirobusta, as described (Lange-Bertalot 1993). This taxon, however, has also been ascribed to the very broad concept of N. amphiboides (Kramer and Lange-Bertalot, 1997, 2/2, taf. 78, figs 27-29). 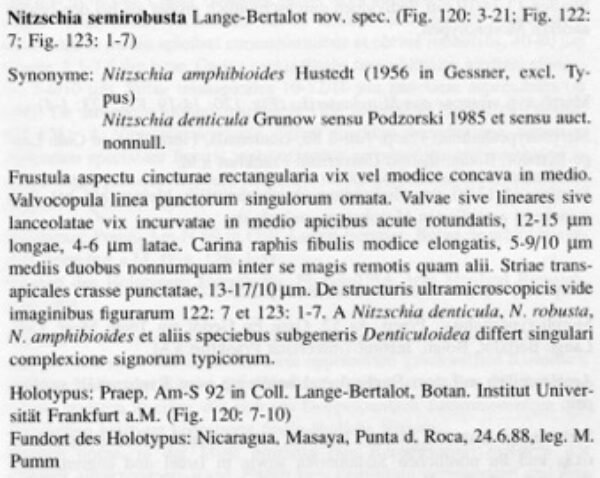 Note that the original description of N. amphiboides by Hustedt (1942) is of a large, broad (9-10 µm) valve. 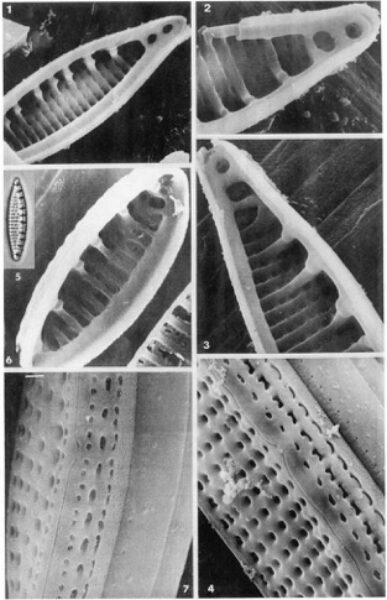 Hustedt reported this taxon from many locations, but the lectotype shown below (Simonsen 1987, Plate 430, Fig. 9) that corresponds to the original description is of a specimen collected in Celebes. The specimens presented here conform to the very wide concept of the species as published by Krammer and Lange-Bertalot (1988, Taf. 78, Figs 27-29), a concept that appears to be quite unrelated to the type. Similarly, the specimens presented here may belong to another taxon, and additional work should be done to clarify their identity. In a related vein, N. semirobusta has been mistakenly reported as N. amphibioides. There is confusion around the identity of N. amphiboides, and it is worth briefly explaining here. 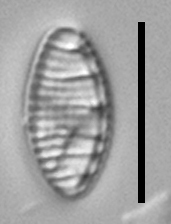 The taxon N. amphiboides has been mistaken for Nitzschia denticula Grunow. 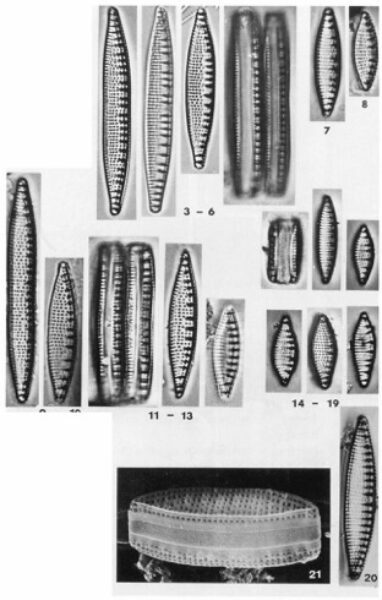 In fact, the name N. denticula is a nomenclatural synonym of Denticula kuetzingii Grunow 1862. 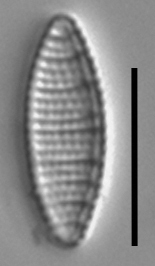 Nitzschia semirobusta is morphologically similar to D. kuetzingii=N. denticula. 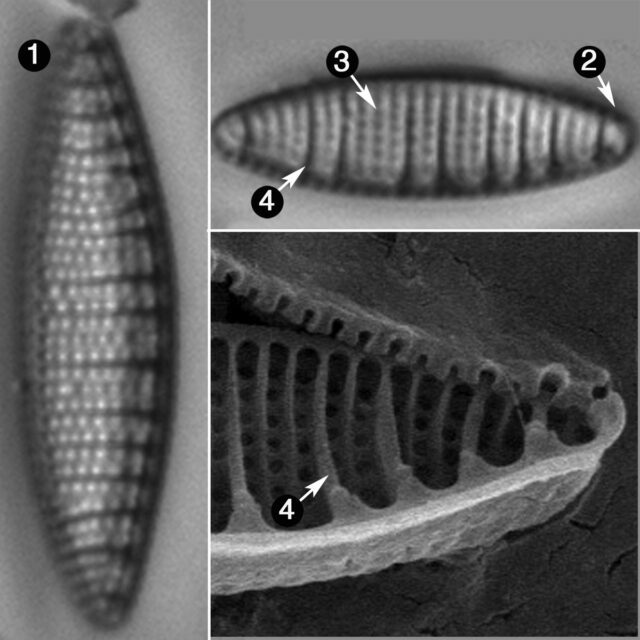 However, the fibulae of D. kuetzingii=N. denticula completely extend across a valve from margin to margin with a similar thickness, while the fibulae of N. semirobusta decrease in thickness as they extend across the valve from margin to margin. The specimens photographed here were collected from Collins Channel (Orange County, CA; latitude: 33.80959, longitude: 117.86157) on March 22, 2013. Water temperature was 24°C, conductivity was 2788 μS, and DO was 13 mg/L. Credit: Photo provided by Aquatic Bioassay Consulting, Inc. Ventura, CA. 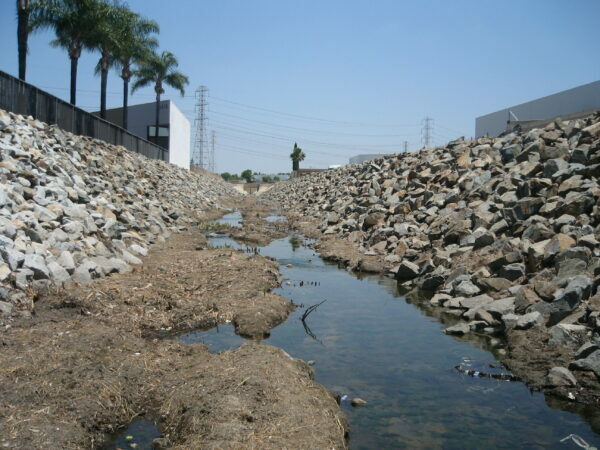 Stream in Orange County, California (Collins Channel, lat 33.80959, long -117.86157) where photographed and measured specimens were collected. Cleve, P.T. and Grunow, A. (1880) Beiträge zur Kenntniss der Arktischen Diatomeen Kongliga Svenska-Vetenskaps Akademiens Handlingar, 17(2): 121 pp., 7 pls. Valves are linear to lanceolate that taper to bluntly rounded apices. Striae are distinctly punctate. The raphe is strictly eccentric. Fibulae are thick at the valve margin and decrease in thickness as they extend to the opposing valve margin. Fibulae may be irregularly spaced along the valve margin with 1-4 striae separating them.